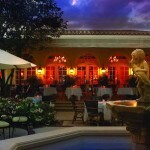 Seafood Bar – The Breakers – Palm Beach, Florida. 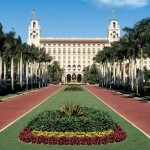 1 S. County Road Palm Beach, Florida 561-655-6611 AAA FIVE DIAMOND – A luxury oceanfront hotel and one of America’s legendary resort destinations. Listed on the National Register of Historic Places, the modern-classic resort exhibits a timeless atmosphere that reflects the elegant comforts and personalization of a grand residence, but energized with a youthful, family-minded philosophy. With the commitment of its original ownership, capital expenditures averaging $30 million a year are reinvested in The Breakers for the long term, to ensure the resort remains appealing to future generations. Distinguished as a AAA Five Diamond property, the resort has earned numerous accolades for its commitment to the environment, community service and the quality of life it provides to its employees. 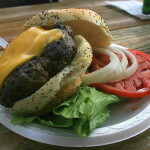 Cheeseburger served with Rock n Roll sauce at Double Roads Tavern in Jupiter, Florida. 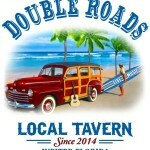 Today Double Roads is the home of live music in Jupiter. But, the name Double Roads comes from a stretch of road just north of Marcinski Road, on the beach in Juno Beach, Florida. It was a favorite hang out for locals in the 60’s, 70’s & 80’s. This stretch of beach hosted bonfires, fishing, surfing and everything truly South Florida. If you mention the name Double Roads, you are bound to hear some great stories of the past! This is what inspired us to create our little hometown bar, Double Roads. We wanted to create a special environment and pay homage to the history of Jupiter, it’s residents, and it’s way of life. This is reflected in offering the best live music in Jupiter and food that celebrates Jupiter’s culture and South Florida history. 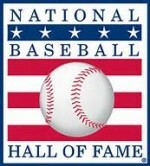 With all of the development going on in our town we wanted to make sure that the history of our town is not forgotten. With local recipes, using local produce and meats, local live bands playing all your favorites, let Double Roads be your hometown bar. A little local spot in the midst of all the new behemoth structures and a place to celebrate our past as well as our future. Double Roads is the place to be with the best live music in Jupiter 7 nights a week and not to mention an amazing menu with creative specials served every night! 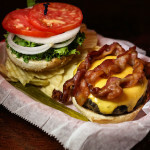 Brass Ring – North Palm Beach, Florida 200 US Highway 1 NPB, Florida 561-848-4748 SEE MENU You can smell the aroma of these burgers cooking from a block away. 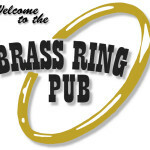 That smell always pulls me toward the Brass Ring Pub as I drive near on U.S. 1 in North Palm Beach. 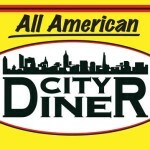 This place has been grilling some of the best burgers in the county for 29 years. There’s no great secret to their deliciousness. 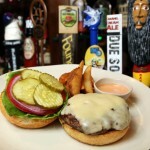 Owner Bret Worcester, whose father and brother founded the pub in February 1986, says the patties are made with Bush Brothers’ quality meat and cooked, unseasoned, over lava rocks on a char-rock grill. “The drippings season the grill,” he says. Translation: more flavor for the next batch! That smoky scent you detect in Buccan’s delectable burgers is the effect of a wood fire on prime beef. 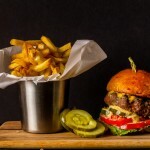 Chef Clay Conley, flavor master, tops his wood-grilled burgers with aged cheddar and serves it on a house-made brioche with cornichons and fries. Outstanding! Welcome. 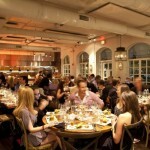 Have a look around, and plan to join us for a vibrant dining experience here in the heart of Palm Beach. At Buccan, you will enjoy Clay Conley’s inventive American cuisine made with the freshest ingredients from the very best sources. Buccan’s signature small plate, big flavor creations are served in a warm and welcoming space. We look forward to meeting you. 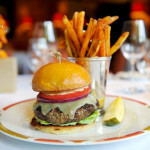 Classic American Cheeseburger at Cafe Boulud. Café Boulud at the Brazilian Court Hotel – one of Palm Beach’s most coveted dining destinations – has undergone a complete renovation! Experience the all-new look and menu this season, just steps from Worth Avenue. 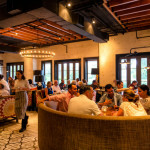 The restaurant’s new design is lighter and elegant, achieved with unique touches like a shimmery ceiling made from sea shells and Pecky Cypress, improved lighting, and warm wood flooring surrounding the glowing bar. The new, expanded bar is dramatically backlit and casts a resplendent glow through the room. It’s a must for cocktails before dinner, with an inventive new cocktail list and craft beers on tap, or to enjoy the crowd and scenery; food is served at the bar throughout the day. The newly renovated terrace and private dining rooms are a destination for entertaining in style, whether for a lavish event or to host a memorable wedding day. The menu balances signature Boulud dishes and French favorites inspired by Daniel’s restaurants around the world, with a spotlight on the region’s incredible seafood and produce. Le Tub – Hollywood, Florida 1100 North Ocean Drive, Hollywood Florida 954-921-9425 SEE MENU Established November 2nd 1959 as a Sunoco gas station…. 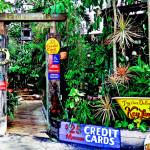 Closed by the energy crunch of the early seventies, your Host purchased the barren property in 1974 and dedicated a concentrated year personally hand building LeTub totally of Flotsam, Jetsam and ocean borne treasures all gathered daily over 4 years of day break jogging on Hollywood Beach. All landscaping, planting and decor by your host. We are a Multi-level , Outdoor seating Saloon, located on The Intra-Coastal Waterway. 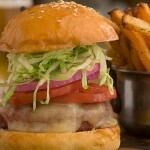 The Best Hamburger voted by GQ Magazine, and Oprah…and as seen on Oprah!!! 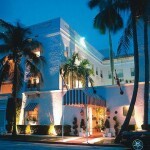 Green’s Palm Beach-151 N. County Rd. Palm Beach, Fl.